Kylie and I rode our bicycles to the park this afternoon. Our goal was to take art supplies with us and draw whatever flowers were found there. Imagine our disappointment when we arrived at the park and there was not a single flower to be found....anywhere! 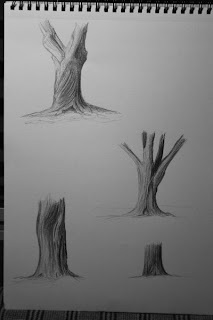 But as I was looking around I noticed that the trees had incredible character. Not the boughs of the trees, but the trunks! They were wonderful. So, I got out my sketch book and pencil and started drawing. As I mentioned in my last post, I am starting to get into drawing and painting images set in the faerie realm. This tree will make excellent references for when I really get to working in that genre. Just looking at these tree trunks I can see dryads peaking from around the back or gnomes leaning up against the base.